Art for the Heart – the name says it all. 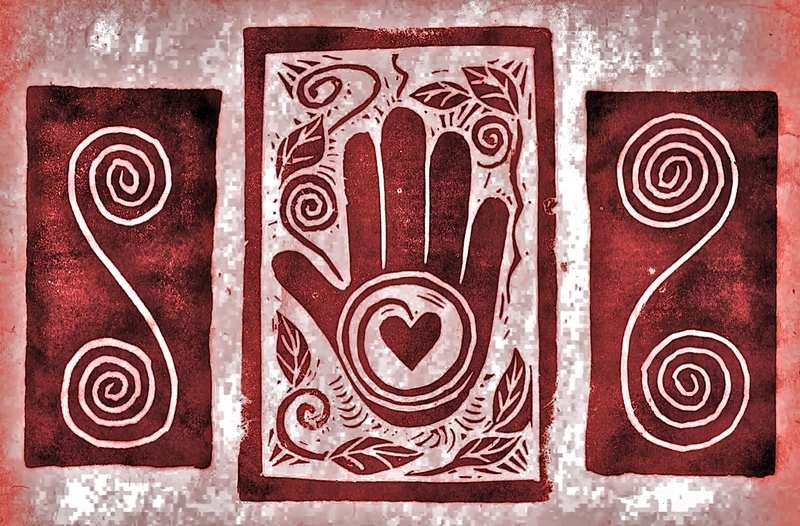 A wonderful community resource, Art for the Heart (AFTH) is much more than your typical art space. It began 1996 as part of a series of community health initiatives that had been going on since 1982. First there was an ambulance service committed to this remote area in southeastern Taos and Rio Arriba Counties. In 1986, a project called, The Laugh Staff was started as a stress relief tool for emergency medical staff. In 1988, La Comunidad was formed to support the health and wellness of the community in whatever forms that may take. Mostly focused on recycling, it also provides a Re-Use Center for sharing and recycling clothing in the community. Its newest project is Celebracion de Cultura: Estamos Aqui Familia y Tradiciones, a multi-cultural celebration of Peñasco and the surrounding communities which is designed to showcase the area’s rich history and traditions and to support community pride. From here, it’s a short jump to providing a place for community expression through the arts. AFTH’s mission is “to foster health through creativity.” Its gallery sits in the heart of Peñasco along the High Road to Taos. AFTH offers free creativity sessions for the public, a weekly Hersday women’s art and support group, monthly workshops, and summer youth programs. AFTH is often called on to help with creative projects such as school projects, murals, and so on. 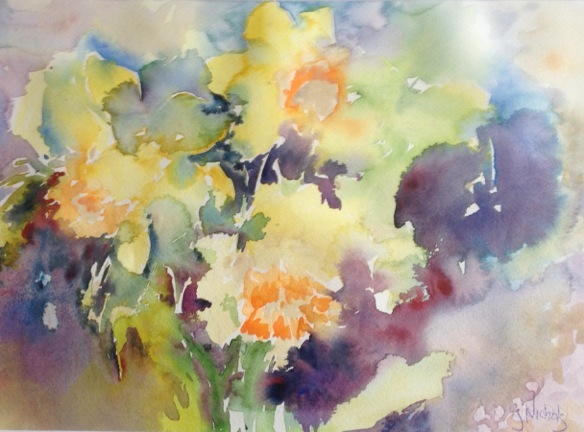 In the AFTH gallery you’ll find – for sale – the crafts and arts created by the community and a variety of established artists. There are paintings, watercolors, pottery, sculptures, jewelry, mixed-media pieces, wood carvings, and furniture, as well as loomed items like blankets, rugs, bags, and clothing. The gallery is located downstairs and out back of Walking Woman Gallery. AFTH boasts a lovely garden setting where visitors can sit and enjoy the flowers and surroundings while they ponder all that AFTH has to offer. AFTH runs a few small projects beyond the gallery. One is the Glam Trash Fashion Show, an almost annual event in Taos since 2001. It is a fun and engaging runway show that encourages reuse and recycling as well as creativity, innovation, and fashion design. It is educational, for all ages, and raises awareness of social and environmental issues. Another project begun by AFTH but now a stand-alone business, UpCycled Fashion uses discarded and donated clothes to create new artistic one-of-a-kind fashions. Its goal is to be a green cottage industry that creates local jobs, saves clothes from the landfill, and provides cutting edge clothing with a conscience. As well as “art for healing” and environmental health, UpCycled Fashion promotes economic health, a very real health need in northern New Mexico. 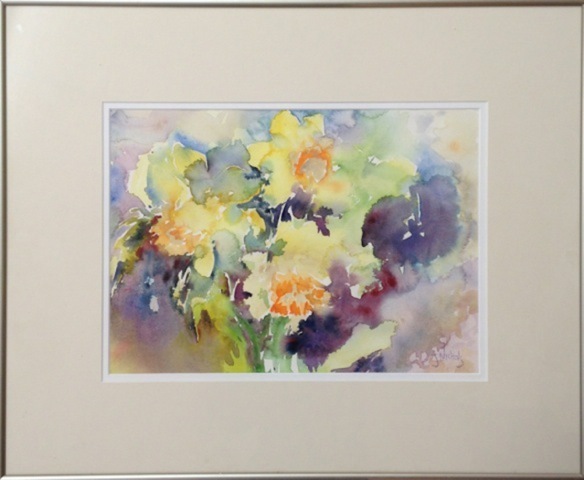 If you’re interested in purchasing “Daffodils” for 10% off, or if you want more information about AFTH, contact them at artstudio@kitcarson.net, or call 1-505-417-0155. Visit their website to see more examples of beautiful works at AFTH: www.Art-for-the-Heart.org.